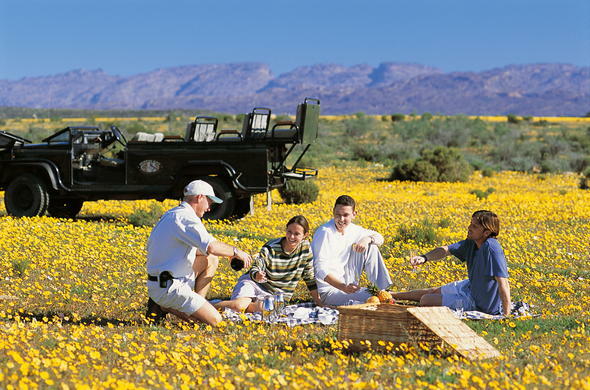 Explore the natural surrounding wilderness on foot or with a sunset nature drive during your South Africa vacation. Look forward to a range of fun activities while staying at Bushmans Kloof during you holiday in South Africa. Spot African wildlife during a sunset nature drive. Some of the wildlife you could see include Bontebok, Cape Mountain Zebra and African Wildcat. There are also 150 different bird species found in the area. Keep an eye out for African Fish Eagle and Black Harrier. Nature hikes are ideal for spotting some of the smaller creatures and different bird species. Cool off in one of the crystal clear rock pools. You can also explore Bushmans Kloof Wilderness Reserve & Retreat by mountain bike during your South Africa holiday. Visit some of the over 130 interesting Bushman rock art sites with an early morning drive and short hike through the indigenous fynbos. A ranger will be able to inform you about the culture of the San people and their fascinating spirit world. Relax with a soothing spa treatment at the spa at Bushmans Kloof. in one of the Unique Touch Therapies, like the signature Cederberg SOULution massage or Hot Stone Body Treatment. A range of treatments are available to chose from, including a selection of relaxing spa packages. Bushmans Kloof is the ideal Western Cape conference venue. The conference room can seat up to 32 delegates while the conference room is fitted with state of the art conference equipment, including wireless internet access. For an intimate Western Cape wedding venue or romantic honeymoon destination, look no further than Bushmans Kloof. A range of different venue options are available, from dining under the star studded African sky to formal dining. Bushmanskloof Wilderness Reserve & Retreat allows you to spot African wildlife either on foot or during nature drives. Some of the African wildlife you could spot include Zebra and Grey Rhebok. Enjoy morning and evening game drives through the reserve to view game - Gemsbok, Bontebok, Cape Mountain Zebra and many other species of mammals and birds.